This project will involve a collaboration between the Town of Jericho, the Chittenden County Regional Planning Commission, the Vermont Agency of Transportation (VTrans), and project stakeholders to identify a preferred approach for improving safety and mobility at the VT 117/Skunk Hollow Road intersection in Jericho. 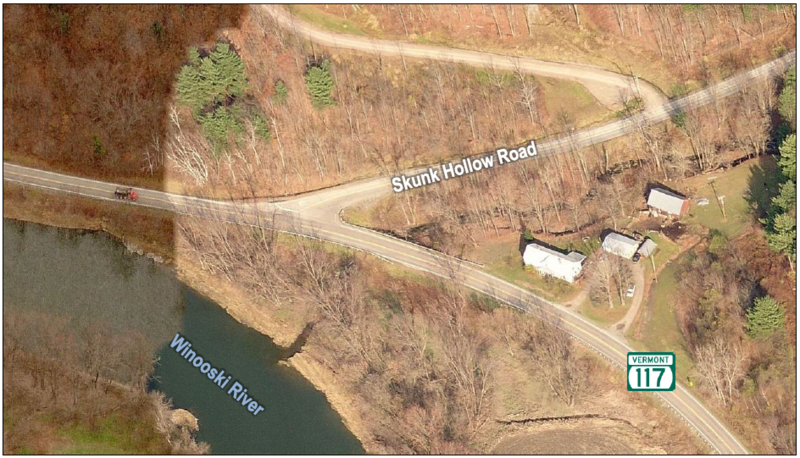 The segment of VT 117 adjacent to Skunk Hollow Road was classified as a High Crash Location (HCL) segment in the 2012-2016 VTrans HCL report with 15 reported crashes (including 3 involving injuries). VT 117 is identified as “High Use/Priority” in the VTrans Bicycle Corridor Priority Map and a proposed facility in the CCRPC Active Transportation Plan. The 2015 Jericho Transportation Plan identified the VT 117/Skunk Hollow Road intersection as in need of safety improvements and recommended improvements be investigated in the near term. For more information, please contact Sai Sarepalli, CCRPC Senior Transportation Planning Engineer, at (802) 846-4490 x *16.